Non-original compatible CLT-K504 laser toner for Samsung printer. Non-original compatible CLT-Y504 laser toner for Samsung printer. Non-original compatible CLT-M504 laser toner for Samsung printer. The Samsung CLP-415N is a laser colour printer that is best suited for fulfilling the printing needs of small offices and home users. The Samsung CLP-415N has a weight of 16.6 kgs and is 10.4 inches in height, 16.8 inches in depth and 16.5 inches in width. It has a maximum printing speed of 18 pages per minute for both colour and monochrome printing in case of A4 size of paper. Whereas its printing speed is 19 pages per minute in case of Letter A size. It supports a wide variety of media types and its output tray has a capacity of 100 sheets and a total media capacity of 250 sheets. Its maximum resolution for colour printing is 9600 x 600 dpi. This printer has a sound emission of 32 dBA when idle and 50 dBA when operating. It has an in-built RAM of 256MB which can be expanded to 512MB. It is Mac, PC and Unix compatible. Black Samsung CLP-415N Toner Cartridges have a page yield of 2500 pages whereas it is 1800 pages in case of colour. 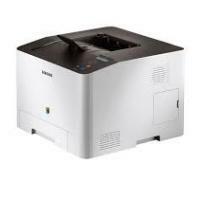 The Samsung CLP-415N is a laser colour printer that is best suited for small offices and home users. It has high quality output and good printing speed. Samsung CLP-415N Toner Cartridges have a high page yield. It has an expandable RAM and good connectivity via Ethernet. But it has a big display screen and limited paper handling capacity. Overall, it is a very good printer for use. Q. How is the print quality of Samsung CLP-415N printers? A. Samsung CLP-415N printers can produce very high quality output which makes them suitable for homes, offices as well as students. They are capable of printing at a resolution of up to 9600 x 600 dpi for coloured printouts. Q. Are Samsung CLP-415N toner cartridges replaceable individually? A. Yes, Samsung CLP-415N printers come with a 4 cartridge system which allows the user to insert 4 separate toner cartridges in the printer. This means that you only have to replace the toner cartridge of the colour that has run out. This helps the user save money and reduces wastage. Q. Will your compatible Samsung CLP-415N toner cartridges work as well with my printer? A. Absolutely! Our compatible Samsung CLP-415N toner cartridges will work perfectly with your printer without any inconvenience. They are FSC tested and certified to work as well as original toner cartridges with your printer. Q. What is the difference between buying Samsung CLP-415N toner cartridges in multipacks and buying them individually? A. There is no difference in the product supplied to you. However, multipacks are best suited for heavy users who perform a lot of print jobs and constantly require toner cartridges. Buying toner cartridges containing all the colours in multipacks is cheaper than buying all coloured toner cartridges individually. Q. What types of paper can I use with my Samsung CLP-415N printer to print on? A. Samsung CLP-415N printers support A4 size paper, A5 size paper, A6 size paper, letter paper, legal paper, executive paper, postcards, envelopes (Monarch, No.-10, DL, C5, C6, No. 9), cardstocks, hole punched paper, transparencies, recycled paper, archived paper, bond paper, labels, glossy paper, coloured paper, and custom paper ( 3” x 5” - 8.5” x 14”) to print on. Q. I use my printer regularly and require a toner replacement almost every month. A. Should I buy the toner cartridges in multipacks or should I continue buying them individually? It is advisable to buy your toner cartridges in multipacks as it is way cheaper than buying all the toner cartridges individually. This will save you on a lot of money and as you are a heavy user, you do not have to worry about the toner cartridges drying up. Q. Is it necessary to store partly used cartridges only in a cool area? Will my Samsung CLP-415N Toner cartridges be damaged if they happen to encounter higher temperature levels? A. Yes, you need to make sure that your toner cartridges are always stored in a cool and ventilated place. They should never be exposed to the temperature which is above the average room temperature range. If they are kept at high temperatures then, this can damage the cartridge. Q. Please suggest me which Samsung CLP-415N toner cartridge listed on this site will give me higher page yield? A. A single Black colour compatible Samsung CLP-415N toner cartridge will give you a page yield of 2500 pages per cartridge at €35.99 (Inc. VAT), while the coloured cartridges print only 1800 pages in this range. But if you go for a 4 pack compatible cartridges you can get this at €139.99 (Inc. VAT). Q. I want to be assured that I have ordered the right cartridges, but I don’t know which cartridge will fit my Samsung CLP-415N printer. Where can I check this on your site? A. To match this, please enter your printer’s model name into the search bar. Then, you will be presented with the list of toner cartridges that are compatible with your printer model number. Q. Why I should buy a compatible cartridge? A. The compatible cartridges supplied on this site can save you on a lot of money! These are the refilled of the originals that guarantee you to produce same page yield as the originals. Q. What should I do If I’m not satisfied with my purchase of Samsung CLP-415N toner cartridges? Will I get a money-back guarantee from the seller?